Well, well, well! We had some mighty fine entries this time around. I had a hard time deciding on who the winners would be. Nevertheless, decided I have, so announce them I shall! I don’t have time for a big long post this time around, but I very much enjoyed reading all the entries, which you can find in the comments section here. A big thank you to Char, JLategan, Joel W., KuraiHeka, Smoya Targaryen, Tim, and Zhalio for submitting haiku this year. Tickled me to death, this one. Unfortunately, there are a couple small issues. First, you were looking for tīkorto for the first word, not tīkorzo. The subject of a permissive imperative must be in the dative. [NOTE: As was pointed out in the comments below, Zhalio was looking for a simple third person command rather than a permissive, in which case the vocative is appropriate. My bad there!] Also, given that I just have the one small bird feeder, lentot would be more appropriate than lentrot. Clever solution for “feeding”, though! I like the idea of a little food hamlet. This is nearly perfect. Rather than she felde, though, I would do ki feldi. Tiny error, but, as I said, competition was stiff this year. Nothing at all wrong with this grammatically, but the winner was too good to pass up. All the same, I love this haiku. Wonderful imagery. Athzheanazar! I absolutely love it. 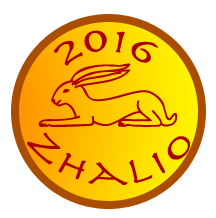 As the winner of the Dothraki haiku competition, Zhalio has earned the coveted Red Rabbit! Very well constructed! I’ll note that I would not use the form pȳdza (it should be pȳdas), and also might not use va bantī, but it certainly works. You were spot on with your use of the instrumental passive in ahīghilis, which I thought was inspired, and your construction for “prey” was likewise praiseworthy. Congratulations to the winners, and to all those who entered! 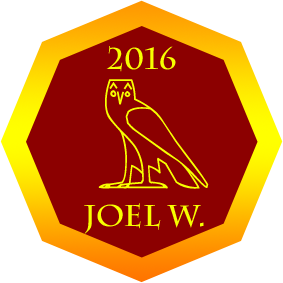 We’ll do it again next year, and I’m sure things will go much more smoothly on my end (Meridian will be more than a year old! That’s easier than two months, right?). Geros ilas ma dothras chek!